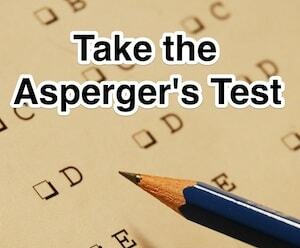 The Asperger’s Test Site is devoted to helping everyone get a free online diagnosis for Asperger’s Syndrome. Unfortunately in these modern times it’s not always possible for everyone to get an official diagnosis. Insurance companies often limit the possibility of this and Doctors\GP’s are increasingly unwilling to refer people for more extensive diagnosis. Using the AQ screening Questionnaire developed at the Cambridge Autism Research Institute enables anyone to gauge where they are on the Autism spectrum and whether they would qualify for an official classification. Take the Asperger’s Quiz. The Aspergers Test Site also offers a whole range of information for adults and parents about all aspects of the syndrome, including sensory processing issues, social skills, dealing with anxiety and treatment options. Please refer to the categories on the right hand side for more articles related to each subject. We also offer a free course about all Aspects of Aspergers. It takes you through what you need to know, step by step following the diagnosis. You can receive the free course here. We get a lot of questions at the site after people take the test. So we thought we would make a list of them to help you get the most out of our site. What does my Autism Quotient test score mean? Unfortunately we cannot give an exact definition of what your individual score means. 32+ is the official score for a diagnosis of Aspergers but there are several bands which can be given a general classification for guideline purposes. You can find more information regarding this on our guide to interpreting the AQ Test. I got a high AQ test score what should i do? For every person the answer to this question is different. For some it’s quite important to get an official diagnosis so that they can see what support is available in their country and for others it’s not so important. Either way we recommend that you educate yourself on the subject and one great way to do that is through our free email course. We have also written this book: Emotional Mastery for Adults with Aspergers to help deal specifically with issues such as anxiety and depression. How do I get an official diagnosis? The process of getting an official diagnosis is different between adults and children. We have outlined the steps you need to follow in this post about the process. Where can I get a diagnosis? We get a lot of people asking this question and unfortunately there is no easy answer. We don’t have the resources to help all the visitors to this site. The best advice would be to start with your Doctor\General Practitioner. Failing that do a search for autism or Aspergers test followed by your local area. I think my child has Aspergers. What should i do? Leslie Burby, one of the contributors of this site has written a very good publication on how to spot Autism and Asperger’s Syndrome in children. It also illustrates the steps that you can use to get your child the help they need in the essential early years of their life when early intervention is critical. Check out Early Signs of Autism on Amazon. Where can I get more information about Aspergers Syndrome? We have covered much of the most important information either on this website or our free email course. If you havent signed up yet we recommend you do. We have also collated a list of books that you may find useful as well as movies that you may find inspiring. I think a friend or loved one may have Aspergers. Should I tell them? This is always a difficult decision to make, but this article should help you make an informed decision. At the moment this a particularly loaded question because of the DSM classification. We wrote a specific post about Autism vs Asperger’s Syndrome. Here is a list of the symptoms that are most common among those with Aspergers. You may associate with some or all the symptoms. We would always recommend starting out with your medical doctor and asking what support is available in your local country. Following that we recommend reaching out to local Autism and Asperger’s support groups where possible. There are also a couple of forums that we can recommend such as www.wrongplanet.net, where there is a lot of peer support from the community. Is there any medication I should take? There is no medication for autism but their is medication for anxiety and many female women that I speak with have found tremendous relief on anxiety meds or ADHD meds depending on the individual so I recommend speaking with a doctor that has experience with ASD patients. Do you have a Checklist for Aspergers? Yes you will probably want to check out this post.